FORDification is a source of information, discussion and help pertaining to the full line of 1973-1979 Ford light-duty F-series trucks (commonly referred to as the 'dentsides'). By only concentrating on this 7-year span of F-100, F-250 and F-350 trucks, we can be much more thorough and complete than other 'all-inclusive' sites. NOTE: This site is very much in it's infancy, but there is much planned for the coming days. Please check back periodically to see the newest additions. Whether you're looking for information on repairing, upgrading or customizing your truck, you'll find a growing collection of information here to assist you. A large (and continually growing) collection of original OEM factory brochures, data sheets, photos, and multimedia from the '60s and '70s. 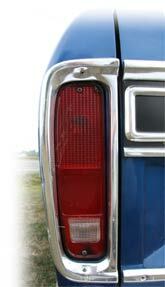 Listing of all safety recalls initiated on F100 thru F350 trucks between '67-'79. 06-15-18 - Posted a complete listing of all the transmission crossmembers used on '73-'79 trucks. 12-28-17 - Posted a complete listing of all the various body stripe kits available on '73-'79 trucks. 03-13-16 - Got started scanning schematics from the '78 Body Builders Layout Book for the 1978 model trucks. Got one done so far...more coming soon. 09-16-11 - Posted a new parts number listing for the '73-'79 instrument panel. 09-02-11 - Posted the parts number listing for the Ford tonneau cover kit. 09-02-11 - Posted the 'Four Seasons' topper (bed cover) parts number listing. 08-26-11 - Posted the '73-'79 Ford Truck Production Numbers page. 07-16-11 - Posted two 1973 brochures to the Factory Literature Library.